When it comes to plug-in vehicles, there are two distinct types. We’ll break them down in a second, but first let us say that there are plenty on sale in the U.S. we’d recommend you avoid. Now, that might seem odd coming from a site dedicated to plug-in electric vehicles, but there’s reasoning behind our don’t buy statement. Several automakers put the bare minimum into plug-ins just to comply (you’ll notice a trend immediately upon viewing the list of 14 below) with various emissions regulations. The resulting vehicles are what we refer to as compliance cars. These vehicles meet the minimum requirements necessary for the automaker to avoid fines, continue selling its gas guzzlers and so on. Basically, these plug-ins exist only so that the automaker can comply and that’s why we suggest you avoid them. In doing so, you’d force some of these automakers to up their plug-in game. A bonus, for sure. So, without further adieu, let’s look at the 14 plug-in hybrids (in ABC order and some are grouped together based on similarities) that we think are compliance plays and that we suggest you toss in the bin of don’t buy. Audi has ambitious electric car plans, but the A3 Sportback e-tron isn’t among them. This is simply least effort possible to get a plug-in on the market quickly, though Audi disagrees with this, saying it’s not a compliance car at all. With its tiny battery and 16-mile electric range, this stylish car unfortunately screams compliance. Disappointment across the board from these BMWs. Lucky for you, BMW sells an excellent pure electric car called the i3 and a range-extended version called the i3 REx. Buy one of those two to prove to BMW that electric range matters. The i8 is the only one in this group of 14 that might not deserve to be here. It’s an exceptional car and BMW truly put a ton of effort into it. Unfortunately, the electric side of the equation for the i8 isn’t strong and that’s why we’ve included it here. However, BMW is upping the battery size and range to 18 miles with an 11.6 kWh battery pack for the upcoming 2019 model, which will become available this spring. There is no 2018 i8. Oh boy. What can we say about these plug-in Mercs? Stylish head-turners for sure. Luxury throughout. But even in this group of 14 cars, the M-B plug-ins really disappoint with electric range as low as 10 miles and a 6.2 to 8.8 kWh battery? What’s that for? An electric lawnmower? Fortunately, M-B is already realizing it made a mistake and is now laser-focused on its long-range EQ series of electric cars. Porsche gets a bit let off the hook here as the battery at least exceeds 10 kWh, but the Cayenne’s hefty curb weight kills any chance it has at a decent electric range figure. Just 14 miles? That’s sad. The Porsche Mission E promises to be quite amazing though. Almost, but not quite. We’re moving up to 18 miles in the XC60 T8, which almost makes our 20-mile cutoff. So close, yet so far. However, Volvo’s Polestar performance brand has some interesting electric cars in the works. Allow us to reiterate that we encourage everyone to buy a plug-in vehicle, but preferably not one of the 14 listed above. By avoiding these compliance vehicles, automakers will be forced to put out cars that focus more on electric, meaning more electric range and bigger batteries. That’s something we should all get behind. Indeed, the lack of sales for several of these PHEVs have already forced the hand of automakers. One such example is Daimler’s commitment to invest billions into pure electric cars. 233 Comments on "Here’s Why You Should Avoid These 14 Plug-In Hybrids"
My 2013 Leaf only uses 23kwh/100 miles. Your not getting 100 miles. My 2015 would only get 60-70 real miles in 70degree weather without any cool or heat being used. I would drive it as easy as possible to get that far. InsideEV’s writers really need to publish & promote an article explaining what those number actually mean. Far too many EV supporters assume incorrectly. I have seen quite a few comments in various articles with that same mistake repeated. “kWh/100 mi” is a measurement of EV efficiency. It states the amount if KWH the vehicle takes to travel 100 miles. It has absolutely nothing to do with how many miles you’ll get per charge; yet, we see replies every time a rating is posted with that belief. You’re both right. The 2013 Leaf has a 24kWh battery, so if it supposedly uses 23kWh/100miles then it would have a 100 mile range. Which is untrue in nearly all circumstances, and also contrary to the efficiency you posted for the Leaf above (albeit a different model year). my 2013 leaf gets 100 miles per charge around town. My 2013 Leaf does the same 100mi. “around town”. Even with just over 18 kWh of useable battery capacity left (16-17% degradation), after almost 5 years, and 55k miles, I can lightly feather my Leaf juice pedal, and get between 5.5 and 6 mi. Per kWh. But, be warned, if you have gassers in a hurry behind you, in any weekday rush hour traffic, you definitely aren’t going to be making any ICE friends along your daily commute. Coal Rollers at any stop opportunity, are known to eat Leafs for Breakfast/Lunch/Dinner! Feathering the pedal to the point of frustrating commuters is not a common scenario anymore than getting 80mpg in a Hyundai Elantra, which is also possible under the right conditions along with lots of hypermiling techniques. We are attempting to measure all EVs using the same yard stick. I think we are missing the objective of some of these PHEV cars. 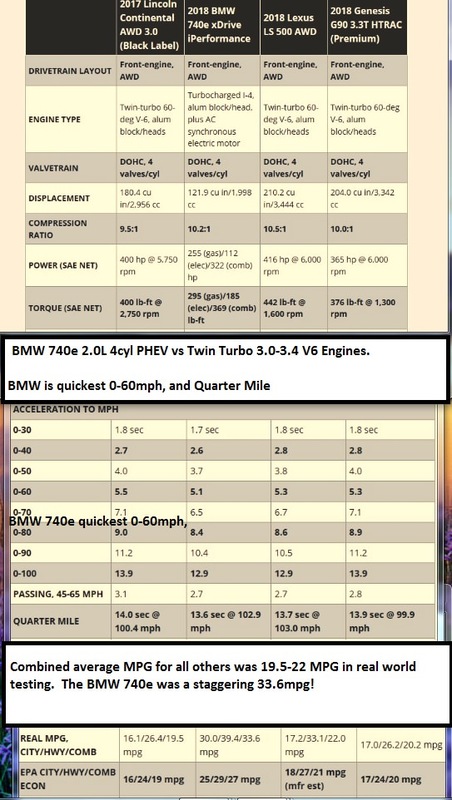 The 740e for example in this comparison test gets 10mpg better than its bigger engine twin turbo competitors, yet it is quicker 0-60, quarter mile, etc. And you can plug it in ALSO. Driving around town, driving through parking lots is a supremely quiet and smooth experience. I agree the plug ins listed here are important and help bring mass market people into the electric fold. 0 to 60 quicker is the whole point of these cars. Quick off the line on electric then the gas kicks in. Just doing it for the performance. You’re assuming the specc’ed 24 kWh is USABLE capacity. It is not, it is nominal capacity. Usable capacity in case of the 24 kWh LEAF is ~21 kWh. And then there is charging efficiency. What the car reports is not what it pulls from the charger. There are losses that should be factored in in the consumption. But not when you’re trying to determine range from what is available in the battery. My 2013 only gets about 45 miles if I run it down below 10%. Ditto. On a good day, my 2011 LEAF would eke out about 75 mile range on 80% charge (which is what Nissan recommended to avoid rapid battery degradation). A 100% charge would give me an estimate of 82 miles. I could push my consumption down to 25 KWh per 100 miles if I drove conservatively and it was not cold enough to need electric heat. Power consumprion in cold weather with even minimal electric heat could easily be over 30 KWh perv100 miles. My experience was the LEAF did not live up to my range expectations. The later LEAF models should do a little better in cool not too cold weather because they can run the.HVAC as a heat pump to avoid power sapping electric heat. You can’t state that as fact. Perhaps he only uses it for low-speed, in-city driving. Perhaps he uses extreme hypermiling techniques to stretch out the range. Maybe a combination of both. The actual range varies widely by personal habit and driving style. The caveat “Your mileage may vary” applies to EVs every bit as well as gasmobiles. YMMV, is where the rubber meets the road! I mean, if we’re talking about what we have gotten that one day then I’ve seen 135MPGe (<25kWh/100mi) on my 2017 Volt. 130 Miles, 4.6 mi/kWh. 150MPGe+. Probably used at 28.5kWh of energy. It is kind of funny how the i3 gives you a warning when you are down to about 15 miles range remaining, and that equals what some of these PHEVs get! But as I said, the fact that they are Hybrids and get better MPG is a benefit in itself. The reverse is also true. Most of those PHEVS will give a reserve warning when they are down to a couple of gallons and that will likely get them as much driving as the i3 does on its entire battery. For my 2016 Volt “Best” I got is 185 MPGe and 60+ mpg on gas, but yes you are correct that’s not what I usually get. I have a 2016 plug in Ford fusion. Been to Ca. twice. Plug in one trip and No problems with car for 1225 miles and 45.2 mpg. Yeah, but at 7.6kWh battery, it really qualifies to be #15 on the list above. Yes, they get 20 miles, but that’s only because Ford pushes the battery beyond what is safe for long battery life (ie: they are dying earlier than the competition). I haven’t heard that before do you have a source? Of course YMMV and your battery may vary depending on how hard you drive it and how often you charge. Those charging a lot (2x/day) and driving 100%EV on the freeway are seeing the worst degradation. Ford PHEVs are also pathetic for the amount of cargo space it takes away compared to the non-plugin hybrid. 5 cubic feet to add 6 kWh? So 50 Wh/L? Add to that – even the regular Ford Hybrids (non plugin hybrids) lose a ton of cargo space too. Ford never really wanted to do Hybrids/PHEVs/EVs. Thanks! Everybody has their own list, but the efficiency numbers need to be fully shown. Deliberately leaving off the Model 3 was a possible unfamiliarity, but not talking about it is irresponsible. It is affordable, very efficient, and definitely not a compliance car. I’m seeing a truckload of them every other week to Minnesota, and counting the brave souls who took factory delivery and drove it home before that, there’s close to 40 in the state now. Depends on if you are driving casually or doing launches to impress that friend or driving over the speed limits on the highway. But nobody is talking about the meter to battery charge efficiency. If you take into account the amount of kWh used to charge a battery, it is higher than the kWh used in transit. It may take 15-20% more power purchased from the grid than is used in use of the car. 120V charging is the worst as the transformation of 120V to high-voltage for the main HV battery is worst. If you could charge at 30A 240V or higher at home, more efficiency. If you could charge at 350-400V DC, even better. EVs have a variety of charging losses and other factors like ambient temperature that affects range. Most people talk “California range at 70*F” rather than Northern Vermont in Winter range. Compared to the inefficiency of ICE cars, who cares? The Bolt for example is a More performance, hot hatch, oriented car and a lot more fun than an IONIC slowmobile. +1 Splitting hairs on efficiency isn’t that important. It isn’t only range you lose, with weak ~10KWh cars. All that money you spend, also gets you a less powerful electric mode. Battery size, range and power, all go down together. We should all care! Better efficiency equals more range what ever size battery you happen to put in it. The difference between 33kwh/100mi and 25kwh is sizable. Especially given that one of the big bottlenecks right now in electric car production is battery availability If you could reduce the size of the battery by 25%, that’s 33% more electric cars with the same range. Sure, they are almost all better than gas cars. But many of the cars on this list use 50+kwh / 100 miles. That’s about the same efficiency as my ICE 2010 prius given 33kwh/gal. If automakers focused too heavily on efficiency, then there would be less variety, and people would just choose gas. Plugin SUVs will have horrible efficiency compared to an Ioniq (e.g. a Model X P100D consumes 39 kWh/100 miles), but an Ioniq isn’t going to sway someone from buying a BMW X6 or Porsche Cayenne, which guzzle gas at 16 mpg. Automakers put a lot of effort into maximizing efficiency for a given body style, because smaller batteries mean more profit. We don’t need consumers to specifically enforce efficiency. Hence the Tesla Model X, and hopefully the Jaguar iPace. Can’t wait to get my local Tesla club to descend upon the poor, unsuspecting Jaguar dealer to check out the iPace, all at once. >> Nonsense. When it comes to PHEVs, a small battery pack with its limited power output has to be compensated by more use of the gas engine, to the point that it becomes difficult or impossible to make any trip without burning gas. No, that is nonsense. Vaguely stating “small” is not constructive. My daily commute, which requires a merge onto a 70 mph highway then maintaining that speed, is no big deal with the Prime using only electricity. The gas engine is not needed, despite the “small” battery. I can’t speak from personal experience, but certainly I’ve seen a lot of argument over whether or not a given PHEV has the gas motor kick in without the driver realizing it. Bottom line, “John”, your claim does not equal proof. And aren’t you one of the serial Tesla bashers here? If so, then we have good reason to believe that nothing you post is true. No, you clearly have me mixed up with someone else. I’m a big proponent of EVs. Funny how once someone offers proof (or at least a claim of proof) you immediately suspect them of being anti-EV FUDsters. How about giving someone the benefit of the doubt before trying to bash them? Ok plug in and ice are about a half kilowatt to one kilowatt a mile next calculate how many miles per day or per century . . That’s a lot of kilowatts we’ve used up.The prius that shook the world, still amazes me one hundred miles an hour a 1.3kWh nickel metal hydride and I fill it up once a month . . .mk2 ! The 2017 and 2018 Ford Focus Electric are rated at 31 kWh per 100 miles, tying the Volt for first place. You mean tied for 7th place. The rating is kWh/100miles, so lower is better. Therefore, the Ioniq BEV is in first place. The Ioniq Electric (BEV) is also probably in last place for 0-60 performance. It’s a tradeoff, low power for high energy efficiency; not a case of superior engineering. The cars with really impressive engineering are the ones which achieve relatively high energy efficiency (low kWh/100 miles) yet still have superior acceleration performance. If the 0-30 is as fast as the eGolf then there will be very few gassers on city streets that can pass you…own experience. I thought this discussion was about comparing EVs? People don’t care much about efficiency. Even people here will favor range and all-electric capability over efficiency. People who don’t care about efficiency don’t drive EVs. They drive gas guzzler gasmobiles. Anyone who cares about minimizing emissions, cares about energy efficiency. It’s part of the same package. Sorry P-P, I’ve driven EVs for 3+ years, 70K miles, and I don’t care about EV efficiency. I care about not burning fossil fuels and still having an awesome car that will take me 600-700 miles in a day (and still have time for dinner and a good nights sleep). That means a big battery and a great charging network. And before anyone says “you are burning more coal”, my electricity comes from nuclear with hydro peaker plants. Until there is no coal generation, every additional KWH used effectively comes from coal. If you used a few fewer KWH’s, the hydro or nuclear plant aren’t going to reduce production. The coal plant probably will. Even if “you” get most of your electricity from your own solar panels, using more still increases demand and increases the need for existing coal plants to fire. Less electricity used means less coal fired plants period. The additional coal generation is the shared responsibility of all users of the grid, not just the last one who plugged in their car. Of course you care. You care because the car’s range is a direct function of energy efficiency, and if efficiency were to drop significantly, then so would range, and you’d care about that a lot. And unless you’re a multi-millionaire, I’ll bet you care about what your monthly electric bill is, too. If the efficiency of your EV dropped significantly, you’d certainly notice that you’d be paying significantly more for your monthly electric bill. So don’t try to tell me you don’t care. Only a fool would believe that. Some ev drivers absolutely care about efficiency. Infact my second ev will have to be more efficient because I can’t add more panels to my roof, I’m maxed out. For the non BEV drivers who read this, it should be noted the efficiency of said vehicles driven at lower speeds (city type driving, 30- 50 MPH), and at reasonable yearly ave. temperatures (Midwest here- not artic Siberia), GREATLY exceeds the EPA averages you have listed. Our 2015 Leaf averages app. 152 MPGe or 4.5 miles/kWh or 22 kWh/100 miles over a year. Sarcasm? Maybe guzzling compared to Ebike. My Bolt goes 250 miles with its 60kWh battery at 70-75 mph, or about 24kWh/100 mi. If we kept it to 65 mph, it would do better, but we charge w solar panels (albeit indirectly), so our efficiency is not A#1 to us. There are two different definition of kwh/100mile here. What you mentioned is the battery output kwh, which is usually ~80% of wall plug power you actually consumed. bmw sells for regular petrol car price for 330e 530e . great value and price. Still quite economic and very fast. many commute very little and still great non diesel choice. there are not that many hpev’s around. I am wondering to myself where these kWh/100 mi numbers are from? If we use the EPA rating for the Bolt, it’s 60 kWh/238 mi, or about 25 kWh/100 mi … 10% difference. The 40 kWh, 2018 Leaf is rated for 150 mi, which translates into 27 kWh/100 mi, not 30 .. also 10% difference. Maybe one set of numbers includes charging losses and the other set does not. 10% charging loss sounds approximately correct. Some people argue that the MPGe rating is preferred, because it measures the electricity you actually pay for, which includes charger losses. Others say that what is important is the actual energy stored onboard, not including charger losses, because it’s the car’s efficiency in using stored energy which indicates what the EV range is. Charger losses don’t affect EV range. I can see arguments on both sides, but it certainly is confusing to see energy efficiency numbers reported which don’t specify exactly what is being measured. This whole discussion is very interesting. The reason that I am buying a PHEV in large part is because I just hate going to gas stations (not to mention that I hate supporting the oil industry any more than I have to). If I can get my commute so that I can mostly drive on electric mode on work days, it means I can potentially reduce my visits to gas stations from once a week to once a month or even less often. >>I am wondering to myself where these kWh/100 mi numbers are from? Those are the EPA ratings. On the FUELECONOMY website, it lists efficiency measurements in the standard “kWh/100mi” unit for every plug-in vehicle. Good result for the Prius Prime. Better than all of the other PHEVs listed, even the Hyundai Ionic! Are you using usable capacity and not nominal capacity? The Volt has a usable capacity of 14 kWh. An EPA range of 53 miles gives 26 kWh/100 mi. ?? Why does that make sense? I would expect the new LEAF to be improved over the old one and get the same or better efficiency. The new Leaf in a sense is more efficient. It consumes about the same amount of energy despite being heavier. The 2018 Leaf is only a tiny bit heavier, but the trade offs are well worth the small weight penalty. Yes, like still lacking active TMS…oh wait, maybe not so worth while. Bmw I8 range and battery is incorrect. Updated late 2017 from 7kwhr to 11.6kwhr and 20mile + range. Bit harsh on the 530e with 10kwhr battery too. All the others true. True for the refresh, which will become reality for the 2019 model year(there is actually no 2018 model). These cars debuted at LA in November and recently in Detroit. They will go on sale this spring with the new battery and longer range. I noted it in the post. Wow. So much for this site promoting EV adoption. While we can hope for more even a paltry 16 miles on electricity is a good thing, especially if the person can charge at work! 32 miles a day isn’t anything to sneeze at nor really is even just 16 for a lot of people’s commutes. A lot of these low range PHEVs cost on par after rebates and credits than their ICE counterparts which gets more people in them and hopefully driving on electricity for a chunk of their miles. I guess to me that’s a good thing. I bet you don’t charge at work, just as I don’t…. i know no one that has an ev that does and i bet most ev drivers don’t have that option so your argument holds no weight. A number of them do. I know some honking X5 and 7-series PHEVs, that take up downtown chargers. A little frustrating, to know their batteries conveniently charge so fast (because they have no range), but the chargers remain taken all day. I get the “destination charging” argument, for PHEVs, like the old Volt. But that was 6 years ago, 16KWh, and close to half the price of most of the cars above. Not everybody wants a $1500 laptop. But after a while when there was enough demand, mass production, economies of scale, and competition meant you can get a decent $250 laptop. There is no law saying 300 mile EV’s have to be super expensive. Just that they are right now. Post a photo, make my day! Must depend on gas prices I guess..and how used to EVs, and how much they care for the environment. I know many people that hardly ever has to fill up with gas. Charge at home, and at work. BMW had to make a special seal on the PHEV gas caps, since people kept the gas in the tank for so long time. To buy a car like this without using it properly, is just to buy an overly complicated car for no good reason. There should be a log, that made the users pay the full price, if they don’t use it properly. My work has about 35 chargers spread around. Interesting! The Province of Ontario added a support / rebate program for installing workplace charging! So, by next round, there will be a reasonable number of such workplace charging points change that mix up here. I charge at work and it all started with asking for them to put chargers in. I agree, I guess your opinion wont be popular here as I guess the readers don’t like cars that save 4000 miles of gas a year. I think that 25 miles range might be a sweet spot, but even offsetting 14 miles a day is a lot. As much as I like my Clarity, in terms of cost effectiveness a battery half the size might be a better balance of cost and savings. Reads like an Evannex ‘article’. My total driving is about 30 miles a day across several trips. Each trip is rarely over 20 with plenty of time in between to top off the battery. So the 18 to 20 mile range of my XC60 T8 will cover over 90% of my daily driving. Doesn’t do much for road trips though. I look forward to having more options in the small SUV category as the efficiency of the XC60 is pathetic at 53kwh / 100mi. The 25mi of the Prius Prime is almost ideal for me if the car wasn’t so darned ugly. Get the Prime, on ‘Pimp My Ride!’? In Holland for some years there were huge subventions for this type of PHEVs, especially for companies, and a lot of their employers got them. I see them parked in the streets at night. Many are not plugged in. The only thing that happened was companies could get them on the cheap and employers were happy to have a fancy car. But only a fraction is plugging them in. That is why the Dutch government ended these subventions completely. Now it’s only for full BEVs. Stories like that are overblown and aren’t representative. And even the few cars that are not plugged in by their first owners will be bought in the secondary market by people who will plug them in. There is no incentive for a second buyer to buy a plug-in and never plug it in. So the worst case is that the majority of the vehicle’s lifespan will be plugged in. And the incentive basically works as a pipeline to get used PHEV’s into the hands of buyers who can never afford to buy new cars. Since the majority of car owners buy used cars because they cannot afford new cars, this helps get PHEV’s into their hands. Its hard to say if thats even true. I’ve noticed with PHEVs a lot of people don’t give over the charger when they sell, and the buyer isn’t used to asking for it. And then when they see the price of the charger, they balk and end up never plugging it in as a result of that, and forget they even have the plug. So you were there personally for all of this stuff you supposedly “noticed”? Since you’re a serial Tesla basher whose only purpose here is to try to tear down the one company doing the most to accelerate the EV revolution, then it’s pretty safe to conclude that if you think it’s good, it must be bad. If you can’t stop the EV revolution, then at least you’d like to see it slowed down by selling these minimalist PHEVs with tiny electric range, hardly any better than mild hybrids, hmmm? If there were a 5% increase in battery energy density every time you used the term “serial Tesla basher” we’d have 1000 mile EVs by now for the cost of a bicycle. If we had a 0.0001% drop in the price of EV batteries every time a serial Tesla basher made an FUD post here, then we’d be able to buy a 200 kWh battery pack for the price of a pack of gum. PEV sales are at 1% nationally, we can’t afford to let perfect be the enemy of the good. We should be promoting all plugins. Agreed… and by not buying these vehicles, it will hardly convince the manufacturers to invest in more electrified vehicles. The only advice I can give people is to stop buying vehicles that have no plug on them. That is the right corse of action to promote more and better plug-in options. Yep: No plug. No Sale. No Plug, No 10kWh + Battery, No Sale! I have to disagree with setting arbitrary battery capacities. I have two houses in two completely different cities, one in theLA area and the other in Portland OR. In LA I own a 2017 Volt and in Portland a 2017 C-Max Energi. Each vehicle is great for my needs in each area. The Volt gets 53 EPA miles (although I usually get 60 or more); the C-Max Energi, with a 7.6 kwh battery gets 20, although I typically get 22 driving around Portland. Since I’m retired, I don’t have a commute and do most of my miles within Portland and mostly in electric mode. That car is perfect for me, and allows me to take longer drives, say to Seattle or to Washington wine country on the ICE part. Lesson to me, what is good for one person isn’t necessarily good for another. So, it would be nice if everyone would stop bashing people for not going for the big BEV vehicle right away. Pathways to enter the EV world will vary. BTW, before I get bashed by any Tesla enthusiast, I’ve already plunked down my $1000 for a Model 3. I completely disagree with this article. Most people simply aren’t ready to go full EV, but these cars might help them put an EV on their radar in a car or two. I had never considered an electric vehicle before buying my Plug in Prius with it’s puny 4.4 kWh battery and 11 miles of range, but those HOV stickers gas savings were enough to get me in the car. Guess what, I was hooked, and my next two cars were full electric. Toyota lost my business since they refused to offer a real EV (the RAV4 EV didn’t count considering at 2600 units produced it was truly a compliance vehicle). These manufactures will convert more people to electric vehicles, and they won’t be repeat customers. Hence these vehicles have their place, no matter how small their batteries and range are. I think the point they missed in getting across, is that there are better PHEV options for purchase. Like the first Plug-in Prius (4KWh), there is a point where you aren’t using enough battery to offer satisfactory electric mode. I’m still a PHEV fan. Heck, on a track BEVs still have a long way to go, but until you reach about 15KWh it’s hard to motivate an automobile, or stay in an electric-mode. Where did you get that misleading information? It’s a matter of how many KW you can pull from the pack, not the KWH capacity. Convert KW to HP for a frame of reference. One does relate to the other. Discharge rates (kW) are in large part a function of battery size (kWh). You can’t really discharge faster then 10C for any lithium ion battery, and usually not for longer than 10 seconds at this rate either. So for a 4kWh battery that is 40kW and only for 10 seconds. That pales in comparison to a Volt’s 110kW, for example, and would significantly limit performance for your small battery plug-ins without the engine coming on. “Where did you get that misleading information? Misleading? It’s perfectly true. It’s your posts on the subject which are, to put it politely, “misleading”. PHEVs with small battery packs can’t get sufficient power from their batteries to accelerate a car up to highway speed in reasonable time, nor climb a mountain, without an assist from the ICEngine. That’s just a fact, and all your claims to the contrary are not going to alter that reality. The first PHEV which was capable of functioning in pure EV mode even when accelerating to highway speed was the Chevy Volt, which originally had a 16 kWh battery pack. Below that, as Pjwood1 correctly says, the battery pack is simply inadequate for normal driving. Unless you stick to driving at ~35 MPH or less, and unless you always accelerate away from a stop gently, then your PHEV is going to be burning at least some gasoline. >> PHEVs with small battery packs can’t get sufficient power from their batteries to accelerate a car up to highway speed in reasonable time, nor climb a mountain, without an assist from the ICEngine. Vague posts like that are totally unacceptable. The reference to “small” could mean anything. It certainly doesn’t mean Prius Prime. Accelerating to and maintaining 70 mph is no big deal with just electricity. Heck, I have even passed others at 80 mph without the engine ever starting. I agree, if a buyer has a short commute and a home charging station, 12-20 miles can cover up most or all of their daily driving on electricity. My wife has about a 7 mile commute to work. One of these cars would be perfectly adequate. When we lived at an apartment last year, another resident had a BMW X5 PHEV and plugged in daily. She probably saved loads of gas every year. Of course, I think what the article is getting at is: Buy a better one to force these automakers to up their game. I don’t necessarily disagree with the concept. I will always recommend a Volt, Prime, Clarity or i3 Rex over any of the above vehicles. But if a person is dead set on getting a large sedan or SUV from one of these automakers… get the PHEV version… please! Demand will be what convinces automakers to up their game. The speed of revolution depends upon the size and class of vehicle. For some sizes and classes of cars it will happen sooner, for others it will happen much later. It will take longer for cheap larger high capacity non-luxury tow capable vehicles to be pure EV than it will for a small short range car or an expensive luxury vehicle. There is no one answer for when it will arrive for every type of car. At this point there has to be not only EV options, but PHEV options, and we still even need higher MPG standard hybrid and ICE engine options. As a broad reference, it typically takes 40 years to make a major energy transformation. Whether that is replacing oil lamps with electricity, or horses with cars, or props with jets, or steam trains with diesel electric, etc. A motorcar is A LOT BETTER than a horse-and-buggy, to the point where they serve almost completely different purposes; the care of a horse alone far outstrips anything associated with a motorcar. In contrast, the difference in practical application between an ICE and a BEV are not nearly as significant. The BEV will likely be a bit cheaper to refuel, while the ICE will likely last longer between refuelings (but require you to visit a gas station instead of plug-in at home). Those are extremely minor differences compared to stabling a horse. When considering the speed of technology adoption, I always like to look at color TV. The benefits of color TV are significant and immediately apparent to everyone. The first US color television broadcast was in 1953, and the last US B&W television station was in 1972. Thank you for your thoughtful response, Spider-Dan. Not to be overly critical but your horse to motor bike transition isn’t particularly good because in the begining a motor cycle or car didn’t function anywhere nearly as well as a horse. Motor vehicles were slower, couldn’t tow, required maintenance, fuel that had to be purchased from specific locations that were not common and had zero off road capabiliety. in 1900 if you lived out of town (which larger %’s of the population did than today) you’d be mad to buy a car. Completely agree, don’t let perfect be the enemy of the good. The pure gas versions of these vehicles are what we shouldn’t be promoting, not their plugin counterparts. So, I just bought the xc60 t8, and it’s AWESOME. do I wish it could do 50-60 miles like my Volt? Sure. Hell, I wish it was fully electric with Model-X like range. But it’s a great car, and with a daily commute of six miles each way, it will spend a lot of time on battery… and when it’s not, its hybrid system is better than pure ICE. I’m with the other commenters – we should be pushing more people to PHEVs, not fewer, especially when they’re price competitive. Great gateway to fully electric. Same situation here. Love the car – for the first 20 miles. Even beyond that, just not as much. Makes me thirst for more electric range. It makes you appreciate just how nice electric is as I dread hearing and feeling the rumble of the engine kicking in. Next car will definitely be full BEV. PHEV’s really are like a gateway drug! They’ll help push infrastructure upgrades along too. How many households aren’t currently equipped with capacity in their garage for high-speed charging? How many fewer could handle more than one vehicle at the same time? Every new home built in the States requires at least 1 garage 20 ampere circuit, besides any circuit for lights. And a receptacle at the end of each car stall. Such a home – without ANY ev preparation, could recharge any 2 GM EV products at the ‘standard’ rate (0.95 kw, even in the Bolt ev) simultaneously. Such a house would provide plenty of miles per day of gasoline-free driving. And although somewhat less than Ideal, perhaps eventually the Homeowner would decide to charge his 2 ev’s with some additional infrastructure. The point is, this is , and always has been, a non-problem. Apartments and Condo’s with their silly HOA’s are the REAL problem. A nice landlord will allow a prospective EV buyer to make SOME kind of arrangement somehow. Its the goofy ones that you can’t reason with. Rather like here. Go easy on these guys. These are gateway drugs. People get a sneak taste of driving electric, and the vast majority only want more EV. These cars reduce the fear among non-EV people about having some EV in their car. Now (after their 1st EV), they will have less fear and more education about EVs, and realize they need more EV power and battery. In the meantime, they are using less gasoline than they would normally. With the big improvements in battery technology coming, I’m not sure why anyone would want anything to do with an internal combustion engine at all. Yes, but that is still 2 years away? If you mean solid state batteries, then probably 4-5 years, or even more. We haven’t even seen solid state batteries in cell phones or laptops yet, and it will take years after that before we see them in mass produced EVs. Because when I take a road trip, I don’t want to stop for 45 minutes every 200 miles. For me, plug in hybrids make the most sense. How about 300 miles and a 45 minute or a 1 hour break, depending on your final destination. Where is your theoretical sweet spot, for making you choose your “all in one – one size fits all” for your non Airport road trip traveling needs? Those big improvements have been coming for 2 decades. Vaporware. The article and the responses leave out a significant category of buyers for whom a smaller battery would be perfect, retired folks who don’t have a daily commute and typically drive only small distances. I’m retired and we have two plug in hybrids, as well as a BEV and a hybrid–in two houses. I have a Volt in LA where a large electric component is necessary to drive mostly in electric mode, but my C-Max Energi in Portland captures most of my local driving in electric mode, with only 19 electric miles (actually about 22/3 the way I usually drive it). The problem is that these PHEVs with such tiny EV ranges can’t be driven any distance without burning some gasoline. With such a small battery pack, it’s impossible for the car to accelerate strongly or maintain freeway speed on battery power alone. I guess if your objective is to merely reduce burning fossil fuels, these minimal PHEVs will fit the bill. But for those of us who actually want to end the everyday burning of fossil fuels in powering transportation, these cars are not even the proverbial “half a loaf”. Much of that claim isn’t true. I guess that’s my point. There shouldn’t be just one goal for every car for every driver at this point. It is good to have some people who want to reduce fuel use, along with it being good for other people who can to eliminate gas to do that. The two goals should not be considered to be mutually exclusive at this point. Two PHEV buyers who cut their gas consumption in half save as much fuel as one buyer who completely eliminates their gas usage. The problem with this argument, Nix, is the assumption that greater efficiency in use of fuel by individuals leads to overall less total consumption of fuel by everyone. In practice, it often works the other way. With increased efficiency (and thus lower amounts of money spent on fuel), people tend to use more, and wind up actually increasing total fuel consumption. It’s called the “Jevons paradox”. And that’s why I always try describe the goal which we should be aiming for, as replacing gas-powered miles with electric-powered miles. Merely using less fuel per mile can be accomplished with a non-plug-in hybrid, or just driving a small fuel-efficient car. Neither of those will actually wean us off using gasoline to power transportation. Larger batteries in PHEVs add weight and reduce efficiency. If people get used to plugging-in every time they stop, the short range PHEVs make most sense. In many European cities on-street EV chargers are omni-present, so it is not a question of charging only at home and at work. Charge-up everywhere! Nonsense. Larger battery packs greatly improve efficiency in PHEVs, because it means they can use the battery pack for more miles, and the gas engine for fewer miles. The Volt was the first PHEV designed to a true switch-hitter, able to perform equally well as a pure EV or a gasmobile. Able to make trips up to ~35-50 miles without burning any gasoline. The Honda Clarity PHEV, from discussion over on the InsideEVs Forum, appears to be about as good, or nearly so. PHEVs with small ranges, such as those listed in this article, simply can’t be driven without at least some use of the gas motor, at least not if they are driven at freeway speeds. Now, if you only need a car for puttering around the neighborhood at low speeds, then why not buy a NEV (Neighborhood Electric Vehicle)? That will satisfy your desire for a small, super-efficient EV with a small battery pack. No need for a full-sized, highway-capable car if that’s all you need it for! It would be nice if you would buy ANYTHING AT ALL since you are always telling others what to do, even if it is something used for a relative. Last I heard you had a 100% ICE minivan that you legally can’t drive anymore, and your only relationship to ANY KIND OF CAR is riding around in their backseats. Real world people who actually drive cannot afford to make decisions about which car to purchase willy nilly, since they have to allocate their wealth (or the car loan, taping future wealth) to pay for it. This type of “all or nothing” article does more harm than good. You have to get away from the extremist views. I drive the the A3 e-tron and have put 15000 miles on the car in the past year, including two road trips of ~1500 miles each. Over two thirds of my miles we’re electric and I don’t charge at work. Even if the battery range is only 10 miles, given that the average commute in the US is 30 miles round-trip, cutting gas use by 1/3 is something to encourage. Just buy a prius or ioniq hybrid; you will save more gas that way, pay a lot less for the car and have a more reliable car too. Plus no freeloading off other taxpayers. You’re full of jokes today…. Inside Evs are disconnected from realities. Some automakers don’t wait for tesla model 3 and provide solutions to make 90% of trips in EV conditions not in 6 months or 1 year but 5 years ago. Inside Evs compare mature / widely available PHEV solution to other new solution. For example, ioniq plugin is a super solution but not as perfect as existant solution. See charges issues on certain ioniq. I think everyone must choose with their needs. If there is more solution it’s better. Nonsense. The only way any of the cars listed in this article are going to make 90% of their trips in pure EV mode is if their speed is restricted to 35 MPH or less, and the car is never strongly accelerated. Those who think these PHEVs with tiny battery packs can operate as full EVs for everyday use, even for short distances, are fooling themselves. As I said in a previous post, if you want a car for just puttering around the neighborhood at low speed in pure EV mode, then just buy a NEV (Neighborhood Electric Vehicle). If you need more than that, then don’t fool yourself into believing that one of these tiny-ranged, tiny battery pack PHEVs is going to cut the mustard. You’re going to be burning gas every time you drive it. I own PIP and my experience is different. City 18km only in EV mode. I disagree strongly. I have first gen PIP and even with that tiny battery doing 45 % of all rides on electricity only. Yes, you have charge like maniac but I dont care. And in the city almost 100 % EV drive. I understand the article point but like middle step the PHEV are great. Yep – first gen PiP with the weakling battery gets me ~25 % of all my driving in Electric mode. The reason the PiP isn’t on this list is that it also gets 50+ mpg when out of battery. But as I said, first Prius, then Prius PiP, then model S – I wanted more and more EV. I won’t even consider the Prius Prime anymore. These cars are surely not for the EV addicted, but not bad for a 1st experience. I agree completely. I’m waiting for cheap good EV so still at least 5 years to go. In the meantime I bought used PIP for 1250000 Yen. (64000 km, 5 years old. Winter EV range 16km, summer 20.) Not bad I think. Yeah, I try to give the old Plug-in-Prius a pass, since it is an economically priced car, and the New Prime F I N A L L Y has a barely acceptable battery in it (25 miles, and a decent charger (up to 3.3 kw)). Of course, it can’t be blamed on a ‘Japanese thing’ since the HONDA CLARITY BLOWS the PRIME out of the water with its TREND SETTING (almost – other than the Gen 2 Volt) 47 ev mile range, not withstanding its dopey, anemic regen. Does have a huge (6-7 kw) charger (how did that happen? ), and At 22,500 before sales tax and after Fed credit, its a STEAL for ANY upscale Midsize. Another intangible is that it is a HONDA and should LAST. This article is wrong in so many ways, ignorant and extremist. It does not help EV adoption. The author does not understand, how you make transition easy for most of the people. I know many people, who are interested in going from pure ICE to a mild PHEV. But i know none (except myself), who is willing to directly jump to a pure EV or pay 10k extra to get a PHEV with a large battery. What is so “extremist” about calling out BMW’s packing <10KWh in $50,000-90,000 cars, like 5-7 series? GM claimed $143/KWh, for its Bolt. 10KWh of battery cells may not even cost 2 grand any more. I agree with the author’s point of view here. Most of these are very expensive cars and they need a LOT of hardware to implement the PHEV functionality – so why not 20 kwh instead of 6? Most of the German Crap just meets MINIMUM German standards (31 miles or whatever it is on their ‘downhill test track’ measurement), so that means 10-15 miles maybe. At least Toyota is moving off the dime a tiny bit by offering the 25 mile P-Prime, a WHOPPING improvement over the PIP. I would have thought that Toyota would have done a better job, on overall looks, for their “WHOPPING” EV range Boost improvement, in their 25 mile EV Prius Prime. It looks like the Honda Clarity PHEV is going to be a nice alternative choice, for those that are put off by the Toyota P-Prime design teams choices. Prime is designed to take on direct competition with traditional vehicles. Owners will experience many drives that are exclusively EV and get absolutely outstanding overall efficiency regardless of when the engine runs. The smaller battery-pack gives it that edge needed to keep MSRP business strong, no tax-credit required. Starting at $27,100 makes it a very realistic for deep penetration into the mainstream. I drive my Prime hard, with 2 no-recharge trips over 1,700 miles each (much at 80 mph) and having to deal with the extreme cold of Minnesota winter. No big deal. 98.5 MPG as of 10.5 months (14,500 miles) and climbing as the temperatures warm. Remember audience. Prime’s target includes showroom shoppers. Being able to grow the market is vital. Focusing only on low-hanging fruit (early adopters) can be a costly mistake. I’m not familiar with BMW PHEVs, but the new-generation Panamera 4 E-Hybrid (2017-2018) is getting routinely 20-23 miles on all-electric (and up to 27 miles in warm weather), with the usual declines in colder temperatures — according to a bunch of owners posting at Rennlist.com (online Porsche forum). And the Panamera 4 E-Hybrid weighs about 4700 pounds. In tight urban / metro areas, the ease of parking, and the low cost (around $100 a month) for leasing a Fiat 500e, it is kind a bargain for budget minded drivers, even if it screams “Compliance” loud and clear, from the highest rooftop. Lease terms for Fiat 500e are closer to $130.-$150. / Mo. 3 yr.-30k mi. Depending quite a bit on your individual state EV rebate program. Any plugin is good even if it has 10 mile range. 10 miles / day driven for 300 miles comes to 3,000 miles / year. Besides the braking energy is captured and used to get another 30 – 50 % extra mileage. But what is bad is paying a hefty premium for the lower range. As the competition accelerates, the cost will eventually go down. Maxing out the tax-credit with a 16 kWh offering unable to achieve high-volume sales that are both profitable & sustainable is a terrible idea. GM made that mistake with Volt. The tax-credits will expire and there nope hope of achieving that goal. Even with the $7,500 incentive, sales are far too low for good business. Volt is trapped as a niche. Striving to deliver something with a reasonable MSRP even without tax-credit help is the better choice. Otherwise, how will traditional vehicles be replaced on the large scale? Many here have been “straight to BEV” preaching, for a long time. That’s how they want the transition, and at this point is where it will go, without respectable 15-25KWh PHEVs ever arriving. It’s about what you want to pay up for, John, not what’s profitable to car makers. The higher end badges are where the price is, it tours better, and electric drive is much more luxurious, responsive, etc. Chevy’s problem was being a budget car & truck maker. The Volt parachuted into a no man’s land, with a ground-up battery design. The compliance cars, above, are where decent batteries could still be profitable. Just less profitable. I don’t have a problem with that. BMW should be selling compelling ground-up battery designs, among myriad body styles, and they have none, zero. I respect capitalism a lot more than the market-making these companies have attempted. Volts problem is as much buying ignorance, as it is being a Compact, with only room for kids ti younger teens or your short friends in the back seat! It’s a great drivetrain, that should go in more products! The Bolt EV could use the front seats from the Volt, keep 40 of its 60 kWh, and an 8-10 gallon fuel tank, and give a 150+ EV mile base, plus 300+ miles more for long trips, or 450+ miles from a start of a trip with full charge and fresh tank of gas! You keep making an appeal to mass marketability, yet the Volt’s top sales months significantly outstrip those of the Prime’s top sales months. So what gives? Prime isn’t available in much of the middle of the country and it has a much lower MSRP. You have to look at the big picture, not cherry-pick certain highlights. Sure, it ought to make it cheapest for the buyer. But it would be much more expensive for the auto maker. Building a PHEV with that good a range means building one with a significantly larger and more powerful battery pack. That would require the auto maker to actually design and build the car to be a PHEV, rather than shoehorn a minimalist PHEV drivetrain and a tiny battery pack into a gasmobile. Are these tiny-ranged PHEVs really helping to advance the EV revolution? Or are they a case of auto makers actually avoiding making compelling EVs, by making gasmobiles with just a little EV tech added? Space is the problem for most car makers. They would have to intrude into passenger and cargo space even more if they increased the battery size. I think the article is good to point out that all EVs are not created equal. Creating super low range PHEVs short changes what can be done with an EV. Anything to encourage manufacturers to step up their game and get serious is good. We’re far enough now that there are real choices available. No need to settle for minuscule range. Waiting for my PHEV Sprinter type van with 50 miles of range. How long are you estimating that you’ll be waiting for your Sprinter? A year or two? 2 Wheel Drive or 4 Wheel Drive (1 motor or 2)? L2 Charging Only, or CCS Too? I agree with a lot of the other comments in this article. Even the <20mi PHEVs are still no worse than HEVs, which are better than straight ICEs. Maybe we just need a program, App, or Web Page: one that we enter our Daily Commute, Weekend Drives, and Vacation Drives; plus Home & Work Charging opportunities, size of Family, & number of Drivers / Vehicles in use, and it charts out the cars, color coded, from best (Geen) to worst (Red), so that we can just select the best that suits our needs? For Example, a Smart ED might cover the Commute (Green), but only part of the Weekend Drive, or Not enough seats for the Family to ride together (Yellow, or Red, accordingly)! Such App or web page might also consider our location, and the nearest locations to buy such selected Vehicle: Proximity 1-10 Miles = Green; 10-40 Miles = Yellow; 40+ Miles away = Red! Or some such idea, with more choices, as required! My ~20 mile PHEV is the best all-in-one car. My daily commute can be all electric, and I can still take it on weekend trips without any ‘range anxiety’ Yes, I have to use gas on the longer trips, but at ~45 MPG, it beats the hybrid that it replaced, and any ICE out there Win-win. The Prius Prime is poised to dominate EV sales this month. AutoTrader is showing about 5,500 Prius Primes for sale, compared to 3,500 Chevrolet Volts for sale. The Outlander has the potential to dominate EV sales also but it looks Mitsubishi is having some teething problems with the US market. Remember that the reason the Outlander tock three years to make it to the US market was because it kept getting sold out in its’ initial markets. The Outlander is a great SUV at a reasonable price and it could easily steal the show if Mitsubishi can get enough of them on dealer lots. Right not inventory of the Outlander on dealer lots hasn’t even hit 1000 so it does not yet look like Mitsubishi is serious about selling the Outlander in the US. Faster fast-charging is another benefit of EVs with larger battery packs. That’s another disadvantage of these tiny-ranged PHEVs; the battery packs are so small that their ability to fast-charge is very limited, in terms of miles added per minute. It continues to amaze me that so many EV advocates are pushing for small battery packs. That’s not the way to advance the EV revolution; that’s the way to keep EVs as limited-capability cars which will only appeal to a small niche market! DCFC is simply too expensive to be worth it in a PHEV. Gas prices would need to more-than-double before quick charging became cost-efficient. While I understand that there are some people who are willing to pay more to stay electric, that small minority is not the basis for a healthy DCFC infrastructure, nor is it sustainable from the perspective of automaker pricing. Too expensive, are you kidding? Look at the list PHEVs above, they are almost all premium models. The people that buy these cars are all about comfort and convenience and a few hundred more for fast charging would hardly be noticed. Sorry but I see no reason for fast charging my Volt. It is clearly meant to be a commuter car, charged overnight. That charge only costs a buck or 2, making it silly to pay for charging on the road, gas much cheaper. Plugged into Blink and they wanted $7.50. Nope. That only makes sense for EVs that have to. So I like this site to learn about EVs, I buy an Audi A-3 etron last September because it really met our needs and now you want to make me feel bad for doing so? Not a way to keep your readers happy. Look at the fun to drive aspect of your A3 etron. It is a drivers car. Enjoy those curves out there, the A3 is built to take em! The Plug-in Purists around here, want the ICE OEMs to give them everything they want today, but of course available at least yesterday. Patience is NOT one of the leading Plug-in Purist virtues. Especially around these parts. Hi William – I 100% agree with you and love how the e-tron drives and love its creature comforts. We never put gas in it the way we drive (and with the fast 220 charger we have). I would just think that this site would want to help people get any EV or plug-in hybrid, as now that we’ve gotten the e-tron I could see us getting a true EV for the next vehicle. Paul, I would take it more to mean this: If you are buying a PHEV in February, 2018, be aware of what is out there, and what its limitations are! If, however, over 90% of your daily commute and/or weekend needs can be covered by the selected vehicles EV Range, and its size and costs suit your needs and budget, go ahead and buy it! Yet, if it will only divert a very small % of your regular driving needs to Electric, and stays in ICE mode over 80% of the time: you should consider one of the higher range PHEV’s, if you want to help move the needle forward! I believe, this approach I just layed out, is clearer, but requires some thinking, calculation, and judgement! Robert – Thanks for your reply, which is well reasoned and describes exactly why we bought the etron -since we got 220 charging at home my wife uses nearly no gas now. We’ve probably have filled it up with gas three times at most since September and those would be half tanks. The problem is that this article doesn’t say what you said and says we shouldn’t buy these cars because they are “compliance cars” so a new reader to this site may just disregard these cars now. Davek – We really like the A-3 etron, as it really checks off all of the boxes for us, as the range is plenty for us and we like the high end interior features and quality. A 220 charger at home is a must though, so please be sure to take that into account when making your decision. After I pushed send, I realized that you don’t have to deal with the 110 volt issue we have stateside! We are using the charger that came with the e-tron which with 220 charges fully in 90 to 120 minutes which has made a huge difference. With the 110 it would take 8 hours to charge. I’m loving my A3 e-tron. 15,000 miles in and about 2/3 have been fully electric. I’ll second the suggestion to get a 240V outlet. We have free weekend electricity and I can recharge quickly between my weekend errands. And it drives like a German car, very quick/responsive when you want it to be. We’ve taken a few roadtrips (~1500 miles each) and it was great. Wish it had a little more cargo room (like my Sportwagen it replaced) but passenger space is fine for 4 adults. Based on my price for electricity (converted to the equivalent gas price), I’m getting around 53mpg. Between this and my father-in-law’s Prius, I know which one I’d rather be driving daily. GAHHH! I didn’t realize there were so many PHEVs with an all-electric range as tiny as the first-generation plug-in Prius! How horrible. Why even bother to engineer and produce a car to be a PHEV but give it such a tiny all-electric range? They say “half a loaf is better than none”, but when you get down to something like 1/8 of a loaf… it’s no more than an appetizer that only makes you hungry for more! I like to say the EV revolution advances in many ways… but these cars aren’t much of an advance over non-plug-in hybrids! PP, You have to realize how bad the “incrementalism” really is. Manufacturers still hold hope for 48V micro-hybrid systems, that don’t plug in, or even harvest kinetic energy like the (15 year old) Prius did. We Americans gripe, but its here where PHEV and BEV are predicted, by IHS Insight, to make up much more of the sales pie. 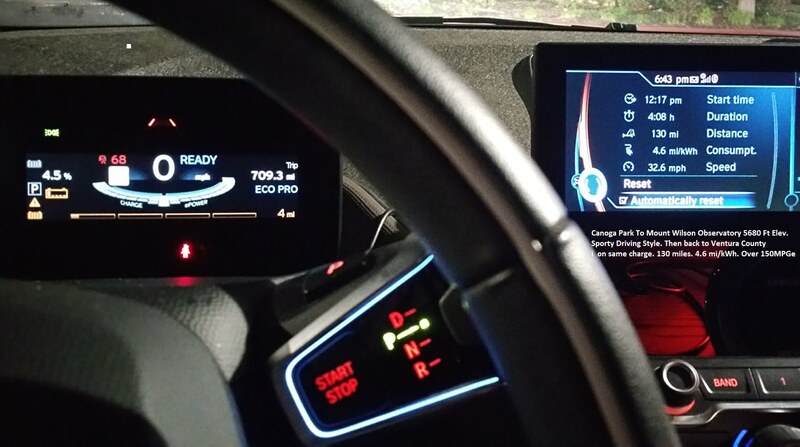 I couldn’t believe until I saw, just how abused a “regenerative display” was, until I drove a 430i BMW. The car has no brake, or driveshaft, regen. Just a “Regenerative 210 Amp Alternator”, that probably came out of a joke bag. Yeah, the micro-EV hybrids which use a beefed-up alternator that doubles as a generator and a starter motor for the stop/start system, coupled with a truly tiny battery pack. Yes, those here who say that something is better than nothing have a point. I admit to some impatience. The problem is that these are not that much better than nothing, so why bother? Just think how many truly compelling EVs could be built with the same amount of effort and money invested! I’m now over 60, and I’ve been hoping to see gasmobiles become obsolete ever since I was a teenager. Yes, the EV revolution is advancing… with excruciating slowness! Well P-P, we just passed January, that’s when Molasses moves so slow, and Detroit Shows its ‘Progress!’ Any coincidence that they match? Yes, it looks funny such a small battery but even so I was really surprised how it helps. So really is still much better than no battery at all. I’m surprised that the Fusion Energi and the C-Max Energi didn’t make the list, their electric only range is not much better than many of those other cars. I can only imagine that saying the models that made Ford one of the top EV sellers for many years were compliance car would seem pretty disingenuous. Both the Fusion Energi and the C-Max Energi have been very popular in Texas. it seems like 20 miles of range seemed to be their threshold for deciding what a decent range is. Regardless, one thing is undeniable about Ford’s products, they are at least available in all 50 states and for the most part seem to be stocked somewhat at most dealers. Of course, with the discontinuation fo the C-Max Energi, I guess the Fusion Energi is their only PHEV at this point. I would be curious to hear Jay Cole on this. Is he still at InsideEVs, I miss his writing and insights? I, too, miss the occasional long but extremely insightful and interesting posts he used to make in the comment sections. I have learned a lot from those, far more than from 98% or more of the news articles here. For my liking i love the Honda Clarity. Basically the same system as the Volt but a much better looking car and has a real back seat that will fit 3 people. But best of all living in Ontario the province gives you a rebate of 14,500 off the price of the car which is a very generous rebate although you pay the sales tax on the full price and then deduct the 14,500 which is a great deal at 26000 plus tax. On the new Tesla electric 18 wheeler trucks government is giving a whopping 70,000 rebate per truck. Honda Clarity PHEV has a back seat that is nice and spacious. Comfort Galore! So… I read the article but I still can’t figure out, why the hell I should avoid them. If it’s a compliance car, so what? A colleague of mine drives a A3 etron, he charges mostly at home, often at work, too. 80% of his commute is now emission free with a nice car. Yeah, makes zero sense. I have an e-tron and have driven about 10,000 miles fully electric over the past year. Not sure how that’s a bad thing. Even if the battery only gives 10 miles of electric range, this cuts the fuel use of the average daily commute in the US by a third. Again, why is this bad? That’s a great example of the problem with a one size fits all comparison with work place charging and a short comute an etron is a great option. When we looked at the leaf we had a look at the Outlander and the Volt. When we look at our driving pattern almost every journey (gap betwen charges rather than each trip) is greater than 50 km but less than 100 km. An etron would have done nothing for us, the outlander would still need to be filled and the volt would be ok but we would still have struggled to get past 80% a leaf works great – that’s not normal or average but that’s wht we need choice. I view the premise of this article, that if we don’t buy them that they will build better cars to be short sighted. Because the other option they have is to just not build any EV’s/PHEV’s at all, and use the lack of sales as an excuse to get rid of mandates. They are already trying to do that anyways. I find this argument the same as if everybody would have said don’t buy the original Leaf in 2011. That a lack of sales somehow would have forced Nissan to build a 200+ mile version back half a decade ago. It simply doesn’t work that way. In fact, what we saw was that when they didn’t hit their initial sales targets, they sold off their battery factory. So we already know what happens when plug-ins don’t sell. Companies don’t double down and build more expensive longer range EV’s. They pull back instead. Good point. You don’t get more-and-better EVs by letting the existing ones sit on the lot. Seriously, this article should be taken down. There are so many mainstream consumers who are so far from ready to commit to a pure electric car, or to spend thousands extra to get something like a Volt. If those people are ready to consider a modest PHEV, let’s welcome them on board, rather than have BEV purists scare them away. This article only throws doubt on a market that needs all the help it can get. Did you read the article? “pure electric car”? I thought I read a piece about expensive plug-ins, with really small batteries. There’s lots of goodness between something bigger and a battery electric vehicle (BEV). What does it say about this article that the majority of IEV readers think it’s ridiculous? I applaud BMW. They now have a PHEV of all their top selling gas cars – 3,5,7 series and X5. Imagine if every top selling gas car had a PHEV vetsion. So some of the customers who are interested in the gas version might consider the plugin. That’s great! And every sale of these low range plugins advances the technology in many ways, as other posts have indicated. The first versions of these PHEVs might only get 15 miles, but in a couple years the plugin 3 Series will prob get 20-25 miles. We should celebrate that instead of making “Very Good” the enemy of “Perfect”. I agree with the article. Small battery cars are not the answer. I find the volt battery is about half the size it needs to be and all these cars are even smaller batteries. In the cold and at highway speeds I could deplete most of these cars in around 5 miles. That doesn’t even get me to the grocery store. On my drive home in the winter I am routinely 50 miles/kwh or more in a vehicle rated around 25m/kwh. Unless you live in a warm urban environment these cars will just frustrate a user and enforce that ev’s have no range. Small batteries also encourages installing public L2 charging. You have to plug in all the time to even make short drives. As there are a lot more ev’s on the road I think these will be quickly obsolete. They simply take too long to charge which means you need a lot of them for even basic charging. As a big battery ev user I need big dcfc to do any meaningful charging. The problem is this, when an PHEV is not getting the electric miles to do the full commute, people just use it as a non-plugin hybrid. I drive an Outlander PHEV. Despite the 12 kWh battery & rated 22 mi range, 90% of my daily driving is in full EV. The fact the car also has DC Fast charging also helps for journeys beyond its initial range – I rather pay for a charge than pay for gas. While I do often wish for a bigger battery, I’m realistic enough to realize a BEV SUV with AWD with a range more than 150 mi for <$50,000 is going to be nigh impossible. This whole "sh** on PHEV" is a stupid trend. First Beverly Hills, now Inside EV. So much for promoting plug-ins if all you do is harp on hating "compliance cars" & planting malice into BEV owners against PHEV drivers. Keep this kind of attitude and that is just going to steer potential buyers back to gas only vehicles. Reading some of the other newsletters which cover European markets creates a different perspective on the electric car issue. Pollution from vehicles is getting worse in many European cities such as London and Amsterdam. Much of it is due to their use of diesels in both cars and trucks. More than one country has passed legislation banning sales of all internal combustion engines within the next 15 years or so. Sales of Teslas have primarily cut into BMW and MBenz sales which has prompted European car makers to rapidly accelerate their development of electric cars. To my recollection prior to the emergence of Tesla and the Volt there was almost no electric car development from Europe other than a few CARB compliant models. In other words the US is a ground-breaker on electric car technology but the primary market today is Europe and China. Both are using air quality as the primary impetus. Take away fracking and put gasoline back to $4 dollars a gallon and the US would also be a leader in electric car sales. Due to taxation the average price for European gasoline is $6 a gallon equivalent. Another problem of those compliance PHEV is that they have lousy mpg on gas. Most of them have the same or worse highway mpg compared to their own gas versions, making it meaningless. edging, with winter range of zero or less. The article left off the Cadillac CT6 Plug-in. That should also be avoided like the plague. Sure, it gets 25-31 miles per charge, but the tailpipe emissions are through the roof (so much so that CARB disqualified the CT6 PHEV for the CA state rebate and carpool lane stickers). Also, the driver has no control over when the car uses the gas engine to supplement the battery. Sure, the car is luxurious, but if the BMW 530e and Mercedes-Benz S550e are (rightfully) on this avoidance list, so should the Cadillac PHEV be. Especially considering that Cadillac’s previous PHEV, the ELR, could go 34-39 miles per charge, never needed the gas until the battery was depleted, and had major improvements made to its acceleration in the 2016 model year. The CT6 is an EV step back for Cadillac – very disappointing. Don’t care what you think, my Audi A3 etron is fun to drive … I am able to go 50% of my driving as all electric on average and then it is still a decent hybrid. Our second car is Prius and I take the Audi anytime over that. good for you, I disagree with this article completely. It can be frustrating that automakers don’t put larger batteries in their PHEV’s but I am firmly in the “anything with a plug is good” camp. I’d rather have Audi A3 etron’s today reducing petrol consumption by 50% than waiting 10 years for the charging infracstructure, battery factories, new model cycle, etc.. before we build the “no comprimise models”. I drive a LEAF, it is the only car in the family it works great but there are others who this won’t work for low range PHEV’s fill an important role in this transition. Wow. Most of the cars on this list have an energy efficiency of only about 2 miles / kWh. Simply appalling! By comparison, the (Long Range) Tesla Model 3 — not exactly a low performance economy car — gets 3.85 miles / kWh. One car Bob Lutz can be proud of is Chevy Volt. Other small battery Phev’s might require frequent battery replacements every few years costing thousands. Come on, man. Someone who writes for a living should know the difference between adieu and ado. My commute is 4 miles (8 per day), and is 90% or so of the driving that I do. So I am in the market for a car with at least 8 miles of real world range- but care about other aspects of the car over any additional range. Are the only reason these cars are on this list because of poor range, or are they bad cars otherwise?